While there’s something comforting about swinging by your local breakfast institute on a Sunday morning for a plate of smashed av and a skinny cap, there’s also something infinitely better about sitting down with a fresh stack of corn fritters and a breakfast cocktail at Fairfield’s Two Fat Monks in Fairfield. Let us repeat that last bit for you: breakfast cocktail. 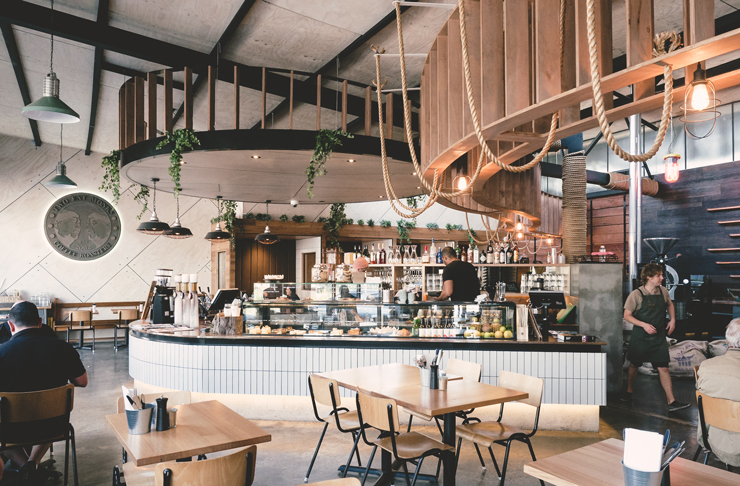 Only six speedy kilometres from the thriving metropolis of Melbourne’s CBD lies one of our region’s most hidden breakfast gems. 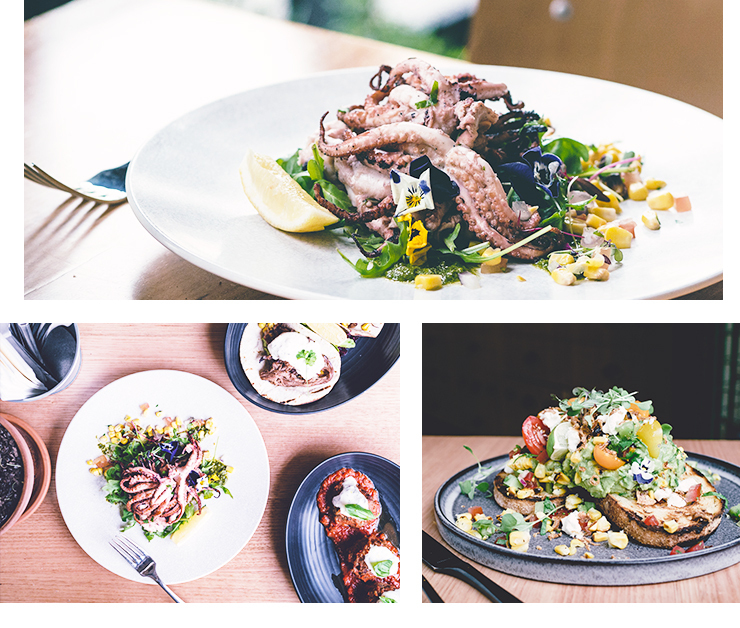 Opening its doors as recently as November of last year, this brekkie haven has already cemented itself on the Melbourne food scene as a strong competitor and triple threat. These bad boys monks make not only their own food, but they also roast their own coffee beans and bake their own French pastries on site. The decor screeaams Melbourne with its polished cement floors, soft wooden trimmings, classic subways tiles and hanging greenery. In terms of comfort and dining space, this venue is taking out the gong because you could swing a full grown tortoise shell tabby over your head without hitting another patron. Now that we’ve intimately described the interior of the cafe with cat-related common expressions, it’s time drop your jaw at their ridic menu. Two Fat Monks boasts not one but two jam-packed menus, but let’s start with brekkie. Turn up in the morning and you can treat your buds to modern twists on old classics like the Twisted Up Avocado Smash with avocado, basil pesto, cherry tomatoes, crumbled feta and poached eggs, or the Mushroom Benedict with toasted brioche, poached eggs, mushrooms, vincotto, truffled hollandaise and goat’s feta. Alternatively, you can throw yourself out of your comfort zone and order the Farm Yard Eggs with slow cooked BBQ beef brisket, poached eggs, smoky hollandaise and dressed greens on brioche, or the Tex Mex style corn fritters with avocado, freshly shelled peas, tomato and coriander salsa, grilled corn and chipotle mayo. But don’t get your frayed denim skirt in a knot sweet tooths, because their signature French Toast is made with scrummy brioche, caramelised pear, summer berries, creme fraiche and maple syrup, which is one combination that’ll have you lying face down in your bed by 2pm. But forget the brekkie dishes, the real reason you need to hot foot it to Two Fat Monks is their breakfast. Bloody. Cocktails. Though you can name your poison (one of three from their menu), we highly recommend the Goldentini, which is a hybrid between an espresso martini and a chaitini. The ‘grammable gold colour gets its good looks from the chai infused vodka, a shot of single origin espresso, more vodka and a shprankle of cinnamon on the top. Boom. Order an Uber because this b*tch ain’t driving home. Moving onto the lunch and dinner menu, if you’re anything like us, you’ll take one look at the Truffled Potato Croquettes in the ‘small things’ section and ask the waiter if they serve it in a main size. Unfortunately, they don’t. Fortunately, though, they do also have a truck load of other ripper sides, like herbed chicken skewers, salt and pepper squid, pulled beef tacos and char-grilled baby octopus (for the ~fancy~ diners among us), that’ll make up for it. If you still have a hankering for some tummy fillers, you can also choose from their sensational list of mains, including the Monks Pan-Fried Gnocchi served with goat’s cheese, heirloom tomato, rocket, fresh herbs and parmesan or their Famous Ruben with house-made pickles, slow smoked beef brisket, Swiss cheese, sauerkraut and Russian dressing on rye bread, served with steak fries. If you’re still full, then you’ve probably riddled with some form of stomach eating virus, but you may as well keep plugging that hole with some insane handmade French cakes and pastries made from their own in house bakery, Monde de Gateaux. And if that’s not enough, wash it down with a big cup of their own house brewed coffee, or even a turmeric latte to keep things spicy. With plates the size of dart boards, coffee brewed from the same dining space you’re drinking it in and the smell of fresh French pastries wafting in from the other room, Two Fat Monks has to be at the top of your food coma wish this list winter. Keep track of all of Melbourne's latest openings right here.